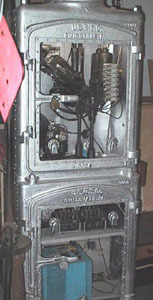 This Union Switch & Signal Company unit came from Gold Hill, Oregon and the design dates back to the turn of the 20th century. 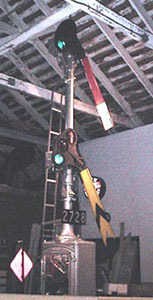 This style of semaphore signals are still in service in the Grants Pass, Oregon area. he semaphore is operational and runs on a timer, which cycles the blades through three aspects; Proceed, Approach, Stop. The motor, relays, and lifting rods are visible during operation through a Plexiglas viewing port. The amazing aspect of this electro-mechanical device is that it is designed to operate on 8 volts DC.